From Interstate 10 in Las Cruces, New Mexico, north to Interstate 90 at Buffalo, Wyoming. For more on this route, see the Interstate 25 Guide. In the state of Wyoming, Interstate 25 generally follows U.S. 87 and serves the cities/towns/communities of Cheyenne, Chugwater, Wheatland, Douglas, Glenrock, Casper, Midwest-Edgerton, and Buffalo. Interstate 25 rises into Wyoming from the Front Range of the Colorado Rockies. Slowly gaining elevation as it leaves Fort Collins, Interstate 25 intersects Interstate 80 at an elevation of over 6000 feet. This junction marks the capital city of Wyoming, Cheyenne. Interstate 25 follows the historic "Yellowstone Highway" from Cheyenne to Casper (old U.S. 185 and U.S. 87). Situated just eight miles north of the Colorado State Line, Cheyenne is home to the F.E. Warren Air Force Base. In addition to the state government offices, Cheyenne is home to a significant government-employed population. It is also home to what is billed as the largest event in the state, Frontier Days. This wild-west rodeo, concert, and carnival happens every July, and it is very popular for tourists and residents alike. Some other attractions in Cheyenne include the state capitol building, the state museum, and the governor's mansion. Interstate 25 mostly bypasses Cheyenne to the west, avoiding the city center and the smelly oil refinery that makes the view of Cheyenne from Interstate 80 somewhat nauseating. The original U.S. 87 goes into the city, providing a direct connection via the business loop to most Cheyenne attractions. For every suburban-sprawl shopping center and store imaginable, take Yellowstone Road (Wyo. 219) north just past the Business Loop 25 intersection, and make a right on Dell Range Road. Continuing north of Cheyenne, Interstate 25 leaves U.S. 85 off, and then it enters Platte County and Chugwater. According to legend, Indians stampeded buffalo over nearby cliffs. When the animals fell into the water below, a "chug" sound was heard. This is one of many explanations for the unusual name "Chugwater." There is not much else to Chugwater, so it's best to continue onto Wheatland. At Wheatland, you can take the business loop into the town. Wheatland is an agricultural town, and it received its name from the many wheat fields that surround the town. Wheat would not grow in Platte County if not for the irrigation system made possible by the Carey Act of 1894. This act allowed for the development of ditches, canals, and reservoirs to expedite water storage and delivery. Continuing north on Interstate 25, check out the large power plant that rests on the shores of the man-made Glendo Reservoir. It is right by the U.S. 26 interchange. The segment of Interstate 25 between Dwyer Junction (the U.S. 26 junction) and Casper is part of the historic Oregon Trail. We have found this segment of Interstate 25 to be the most scenic. Upon crossing the Converse County line, you will reach the small community of Orin, famous for being the end of U.S. 18 (and historic U.S. 185) and for having a future rest area planned for the interchange. Now joined by three U.S. routes (20, 26, and 87) on the way to Casper, Interstate 25 reaches Douglas, the home of the Wyoming State Fair. In the early days of statehood, each town received a state-operated facility. Cheyenne received the state capital, Laramie received the state university, Rawlins received the state penitentary, Evanston received the state hospital, Worland received the state boys school, and Sheridan received the state girls school. Douglas was lucky enough to get the state fairgrounds. Since 1905, Douglas has hosted the Wyoming State Fair, an event typically overshadowed in popularity by the Cheyenne Frontier Days, but it is certainly popular within the state. Interstate 25 quickly leaves Douglas behind, heading due west to Glenrock and Casper. Along this portion of the route are several Oregon Trail historic sites, including Deer Creek Station and Fort Caspar. In case you're wondering, yes, Caspar is the correct spelling of the man for whom the city of Casper is named. However, a spelling error led to the current spelling of "Casper," the Natrona County seat. Casper, the second largest city in the state, is home to the second largest school: Casper College. Some folks hope that Casper College will become a four-year school soon. "Wyoming State University," anyone? Just south of the city is the magnificent Casper Mountain, which adds some needed character to the city. The vistas and hiking on the mountain are fabulous. You can also check out Wyo. 252, the gravity-defying road. One of the major state newspapers, The Casper Star-Tribune, is based here. One can find the Casper newspaper throughout the state. Casper is centrally located for delivering news throughout the state. Although much of the news is satellite fed, at one time it was more crucial to be in a central location. Casper is at the nexus of many roads, so its role as a crossroads cannot be emphasized enough. Interstate 25 loses U.S. 20 and U.S. 26, the Yellowstone Highway, and its westward direction at Casper. The Interstate turns due north, along with subservient U.S. 87, toward north-central Wyoming. But back to Casper -- why is a city this size located here? Certainly part of the reason is the lack of any other sizable towns around (several hours to Billings, Rapid City, or Cheyenne). However, the big economic driver of Casper is oil. The big oil companies all have staked oil rigs in the area around Casper. In fact, the Teapot Dome scandal took place at a piece of land approximately 35 miles northeast of Casper. The Teapot Dome area was set aside by President Taft in 1912 as a Naval Petroleum Reserve. However, in 1922, independent oilmen discovered that the land was being leased to select oil companies without competitive bids. The oil companies were not supposed to be using this reserve. This scandal resulted in the resignation and incarceration of the Interior Secretary. Doesn't it seem like interior secretaries are trying to do the opposite today? For example, look at former Interior Secretary Bruce Babbitt in 1997 balking at opening up the new Grand Escalante Staircase National Monument in southern Utah to any kind of oil exploration. Beyond Teapot Dome, Interstate 25 enters the Salt Creek oil field, one of the world's largest "light oil" producing fields. The town of Midwest, sadly bypassed by the Interstate so travelers to Buffalo can save an extra five minutes, would languish on the side of the old U.S. 87, but the oil is keeping the town alive. North of Wyoming 387, Interstate 25 and U.S. 87 continue north toward Kaycee and Buffalo. You will enter Johnson County, the home of the infamous Johnson County War. This war between the cattle barons and homesteaders over land and rustling defined this area's history. You can see the remains of some of the homesteaders' ranches. The TA Ranch, right along Interstate 25 fifteen miles south of Buffalo, still has buildings standing with bullet holes from the gunfights. Interstate 25 finally winds down from Kaycee (named after the KC Ranch) into Buffalo, where it ends at transcontinental Interstate 90. U.S. 87, Interstate 25's companion since Raton, New Mexico, continues north along Interstate 90 to Billings, then continues on its own to Great Falls, Montana, and points beyond. The first contract for construction of the Interstate Highway System in Wyoming was awarded on September 26, 1956, for a 10.1-mile section of Interstate 25 between the U.S. 85 (Torrington) Interchange and the Whitaker Road Interchange. Succeeding construction began on Wyoming's north-south Interstate, with that segment constructed and open to traffic by the late 1960s. Interstate 25 replaced historic U.S. 87 almost in its entirety, with the exception of a segment between Glenrock and Casper. Now U.S. 87 is cosigned with Interstate 25 and the Interstate 25 business loops throughout Wyoming, while some of the older segments are either locally or state maintained. The table below outlines the construction of the various segments of Interstate 25. Of course, as newer segments opened, older segments were repaired. By 1985, the entire Wyoming Interstate Highway System was completed. Wyoming's final section of Interstate 25 opened on February 2, 1982, with the completion of 26.5 miles of Interstate highway between Casper and Kaycee. Over $183 million was spent on the highway between 1956 and 1982. 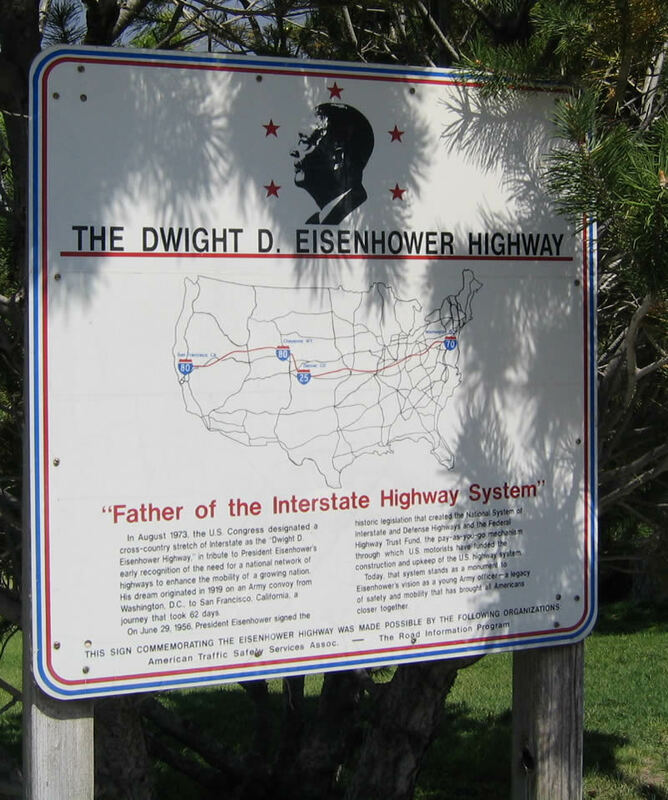 At the Welcome Center located at the Exit 7 interchange is this informational sign showing that the section of Interstate 25 between Denver and Cheyenne is part of the Eisenhower Memorial Highway, which travels across the United States from San Francisco to Washington, D.C. via Interstate 80, Interstate 25, Interstate 70, and Interstate 270. Photo taken 09/01/04. Like Interstate 80 and Interstate 90, Interstate 25 between major towns can be closed due to inclement weather. 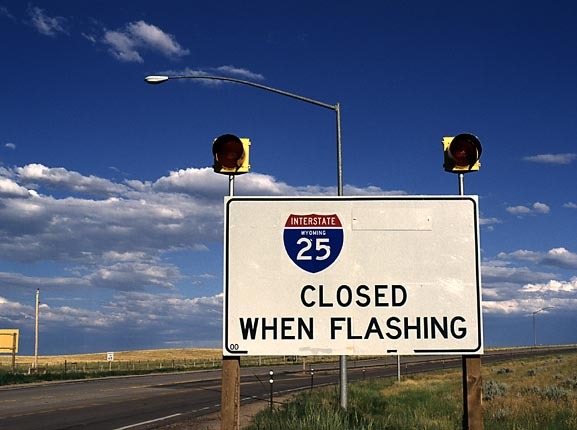 This closure sign is located near Douglas along Interstate 25. The highway is closed when the beacon lights are flashing. Photo taken 08/15/01 by Rich Piehl.